We try to use coconut oil every chance we get, from oiling the pan for scrambled eggs in the morning, to homemade mayonaise and salad dressings, to dessert recipes and homemade candies. Soon, I hope to send out an email about the massive health benefits of coconut oil, but today I just wanted to focus in on the different kinds, and what they’re good for. 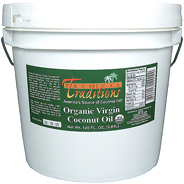 Although we’ve been selling three different kinds of organic coconut oil for quite a while, our family just bought a gallon of the green label virgin coconut oil to try for the first time, and we just LOVE the smell and the flavor. So we wanted to put it in the spotlight. And for those of you who aren’t familiar with the other kinds of coconut oil, we’ll highlight those a little bit too so you’ll have a good idea of which one would be best for your needs. Expeller Pressed Coconut Oil is our most popular coconut oil. 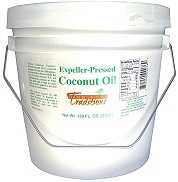 One of the reasons we love Tropical Traditions’ brand of expeller pressed coconut oil is that it’s extracted mechanically, without the use of chemical solvents. This is the coconut oil our family uses the most for three reasons. 1.) It doesn’t really taste like anything, so you can fry things like eggs in it without adding coconut flavor to foods that just weren’t meant to taste like coconut. 3.) Although it has fewer antioxidants than virgin coconut oil, it still contains almost undiminished amounts of medium chain fatty acids, coconut oil’s best benefit. 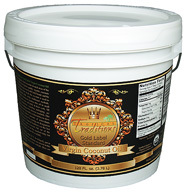 The “Green Label” and “Gold Label” oils are both virgin coconut oils (VCO), which means they are made from fresh coconut and that no chemicals are used to extract the oils, neither are they subjected to high heating. The neat thing about the Gold Label coconut oil is it’s wet milled by hand using traditional Philippino methods, which results in a coconut oil that is higher in antioxidants than mass produced virgin coconut oils. It’s fun to watch this wet milling process on video, and it gives you an amazing appreciation for where this special food comes from. Watch the video here. Take, for example, a somewhat unripe banana. You eat it fresh, and although it tastes like a banana, it’s a little bland and harsh all at the same time. Dehydrate it, and the flavor becomes sweeter, stronger, mellow, and fragarant. It’s the same concept with Green Label VCO. Because it’s pressed from quick dried coconut, the coconut flavor and smell is concentrated in the oil. So we keep all three kinds of coconut oil in the pantry now, each for its own best purpose. If you like the flavor of coconut but you haven’t tried the Green Label VCO, we encourage you to order some during our current wheat and dry goods order. We’ve made more available now than usual, so it’s a great time to try the Green Label or either of the other kinds as well. Order for local pick up here. Or have your order shipped to you directly through our store here. What different kinds of coconut oil do you use and for what purposes?